I’ll admit it, until I tested the new Canon 6D, the Nikon D600 was my camera of the year for 2012. Now that’s not to say it was the best camera made, but when you consider price, performance and features, it was a pretty tough camera to beat. When I got my review unit of the 6D from B&H, I wondered – would it be Canon’s answer to the D600? Now as a Canon shooter, I am very fond of my 5D Mark III which I declared as the best camera for parents due to its great high ISO performance and advanced auto focus performance (an area where the D600 is very weak by comparison). However the 5D Mark III was nearly $1500 USD more than the D600 when I did my 5DM3 vs D600 comparison article, so it was tough to deny the value of the D600. My hope was that we’d get a 6D that was a cheaper version of the 5D Mark III, but where would the corners be cut to reduce the price? Sample Images – Yeah, this sensor rocks! This camera creates some delicious images that seem to even out perform the 5D Mark III at the highest ISO’s. The images you see below that weren’t shot in a studio are real world shots with NO flash, filters or enhancements. They are literally point and shoot shots usually in auto white balance (AWB) with Auto ISO and either Aperture Priority (most common) or Manual. You can visit http://www.ronmartinsen.com/canon/6d to see more of my test images which includes both real world and studio images. HDR enabled with Auto “Adjust dyn range” and Auto Image Align enabled resulted in an image that addressed the blown out flower in the background at the expense of both noise and detail/pop of the subject flower. To me this feels just marginally better than the s110 and G15, so this feature shouldn’t be a major influence on your purchase decision. I still think you’ll want Photomatix or HDR Efex Pro if you want to do any serious HDR work. Except where noted, all of the following images were shot in a studio using my Elinchrom lighting setup. These images are the original in-camera JPEG images that have been exported as originals from Lightroom with no modifications. There is no cropping, adjustments or anything, so please excuse the well known flaws in all of the images. While these are my outtake images, these are all copyright Ron Martinsen – 2013 and ALL RIGHTS ARE RESERVED. You may click to download the original images for your personal review, but you must delete them after viewing. You may not modify, edit, or use these images for any purpose without a notarized contract. Overall, I like this camera. It’s got a great sensor and 5D Mark II users will feel right at home. While I still think wedding and event photographers would be better off getting the 5D Mark III or 1D X, this camera is perfect for the family or hobbyist shooter. It’s definitely a must upgrade camera for anyone with a xxD series (i.e., 40D, 60D, etc…) with the caveat that this is a full frame camera so your EF-S lenses aren’t going to work. The joystick multi-controller on the 5D Mark III is replaced by a 8-way pad on the rear dial like you find on the 60D, and personally I despise it. It seems to be touch aware so it’s very easy to get your AF point in the wrong spot or change your aperture while adjusting your AF point. It’s a horrible design, so the lack of a joystick is almost a show stopper for me. The low-light AF speed reminds me more of the 1D Mark III than it does the 5D Mark III, so that has been a big disappointment. Now before everyone flips out and starts rumors, I’m not saying it’s unusable or any worse than the D600. However, I have noticed that it doesn’t acquire focus as fast as the 5D Mark III and 1D X in identical conditions with the same exact lens switched between cameras. Granted they were very tough low light conditions (like you’d find in a night club), but there is definitely a measurable downgrade. Just like the D600 – I wish there were more AF points. However, the 6D AF points feel better spread out to the edges to me than those of the D600, but that could be because I’m a Canon shooter and I’m used to the 5D Mark II. 5D Mark II users won’t feel much of a difference, and I didn’t find it unusable – just different to what I’m used to with my new fancy schmancy cameras. The last gripe I have is the fact that HDR Mode is disabled when RAW image quality is selected, and if you go JPEG only you still can’t have it keep the individual exposures like the 5D Mark III. That really annoys me when I don’t think that was a cost cutting feature, but rather a marketing decision. Boo, I hope this gets addressed in the firmware down the road! The 6D creates stunning images that feel on par with my 1D X and it does so for a fraction of the price. It’s also about the same price as the D600 (based on the current sale that ends on Jan 5th). All of the important features are present and it definitely feels to me like an upgrade from the 5D Mark II in every way except for the lack of a joystick. Click here to read my part II of this review. 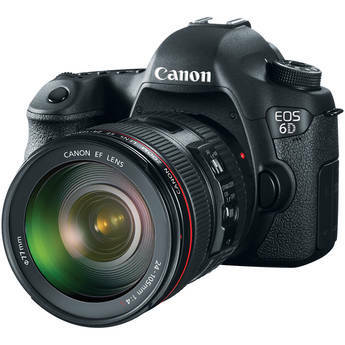 Click here to go to see the best deals on the 6D including the latest rebate offers. Which lens should I buy? If you make a purchase using links found in this article, I may make a commission. It doesn’t cost you a penny more, but it helps to support this blog so I appreciate your support! B&H loaned me a 6D for this review but has had no other influence or input on this article. Neither Canon nor Nikon previewed or worked with me in any way for my 6D and D600 reviews. What jpeg setting(s) did you use in the 6D for these photos? It's the same as I did for the D600. Hello Ron. I'm over 3 months analyzing a good buy for what I want to do. I intend to work with photos of Studio and architecture. Currently I am a Architect here in Brazil, but this opportunity arose to work with photography as well, something that has always been passionate about. Well ... always been a fan of Nikon. But while analyzing deeply felt the set Canon better deal. First I became interested in 7D, but to have a good result, would have to buy a good lens, like the EF 24-105/f4 (Problema. .. I only found the 7D kit for sale, not body only) which would not have much difference in price for the 5D MarkII already with EF 24-105/f4. When the 6D was launched immediately despised by those who seemed to offer. Everything looked better on the Nikon D600, autofocus, dynamic range, ISO hight, body building. But after seeing a lot of reviews, I saw what was wrong. It's so good as or even better than the D600. My question to you who worked with the 5D mark II and experienced the 6D is: Which has a better performance in the studio and for architectural photography? No question, the 6D is much better than the 5D Mark II from what I see in real world use. I like the body controls (mostly the joystick) of the 5D Mark II better, but the sensor and image quality of the 6D is far superior. Thank you for your attention and quickly respond. Another question. I saw on a forum that there is a deficiency of 6D over 5DII on off camera flash control. They said that working with off camera speedlight, the 6D would not have some controls that have on 5DII. I intend to buy a 430EXII (which I know will not let me down) and three more Youngnuo YN560EX on umbrellas and softbox. Also using Youngnuo 622C triger in each one. In this system you could tell me what would this limitation of 6D on the 5DII? What the 5DII does that 6D does not? I'm not familiar with the 6D flash issue you are talking about. It worked fine with my gear as you can see from the photos in the article. In addition to my Elinchrom gear, I used the 600EX-RT with the ST-E3RT and all was well. I don't use older equipment so I can't comment on that. If you have concerns, get a 5D Mark II - it's still a great camera. If I were using my money, I'd get the 6D. Hi Ron: I am Anton and I am a studio photog who's interested in moving to ff for my continous light photoshoot. I plan to use the 6d for strobe shoots as well. I use radio trigger to fire my strobes and my working focal length ranged from 24-300mm. I rely on the 1/250s xsync from my 40D & 60D to compensate the long focal length. My question is, does the slower xsync from the canon 6D affect your studio work? Would you recommend the 6D for shooting at long fl with strobes? As you can see from this article, I found it to be suitable for my needs and the type of work I do. Your mileage may vary, but I feel it is just as capable as the 5D Mark II. Here's another shot I did during that shoot. Thc for the quick response, Ron. Great work and have a good weekend.